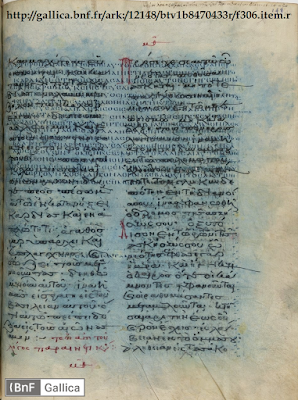 Today, let’s take a look at some palimpsests among the New Testament manuscripts. What is a palimpsest? 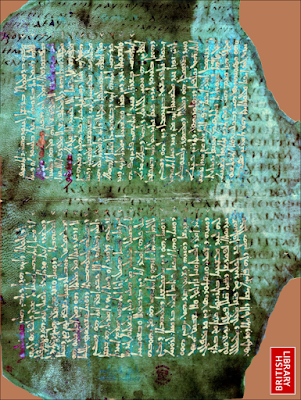 A palimpsest – so-called because the parchment has been scraped twice; once in the course of the manuscripts’s initial production, and again when it was recycled; the term is derived from the Greek words πάλιν (again) and ψάω (scrape) – is a manuscript that has been recycled. After the manuscript was initially produced, someone came along, took it apart, and removed the writing by washing and/or scraping it off the parchment, so that the parchment could then be used as writing-material for another composition (sometimes even another copy of part of the New Testament). This happened especially (but not exclusively) in places where writers did not know Greek and/or did not have the means to buy (or to easily buy) new parchment. We are able to read palimpsests because the recyclers’ efforts to scrape away the ink were frequently only partly successful; ink embedded in the parchment-material was not so easy to erase completely. Sometimes the lower writing (the older writing) is in the same format as the upper writing (the more recent writing that covers the older writing), but in other cases, it is upside down or sideways compared to the upper writing – and this can vary in the same palimpsest. Codex C can be recovered. It is online at Gallica (BnF). 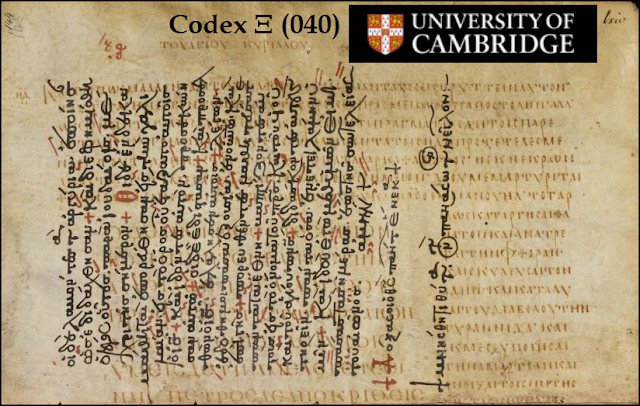 ● Codex Ephraimi Rescriptus (C, 04) is an important manuscript made in the 400s. In the 1100s, someone recycled its pages, and used them as writing-material for a Greek translation of some of the writings of Ephraem the Syrian, written in Greek minuscule script. That is how the manuscript obtained its name. For many years, European scholars attempted to read the lower writing, but with limited success. Finally in 1843-1845, Constantine von Tischendorf (who is perhaps best-known for his acquisition of Codex Sinaiticus) carefully transcribed the text of Codex C, representing part of the Old Testament in the Greek Septuagint version (Job, Proverbs, Ecclesiastes, Song of Solomon, and the apocryphal book Wisdom of Solomon) and almost every book of the New Testament (except Second Thessalonians and Second John). Tischendorf also noticed the corrections in the text, introduced by three distinct persons in the 500s, 900s, and (probably) the 1200s. Tischendorf’s work, while excellent, could be improved or at least double-checked (as R. W. Lyon attempted in 1958) by the use of multi-spectral imaging. Hopefully this will be done before the manuscript’s Greek text becomes completely illegible as result of the harmful chemicals that were used upon it in the 1830s in attempts to make its lower writing easier to read. 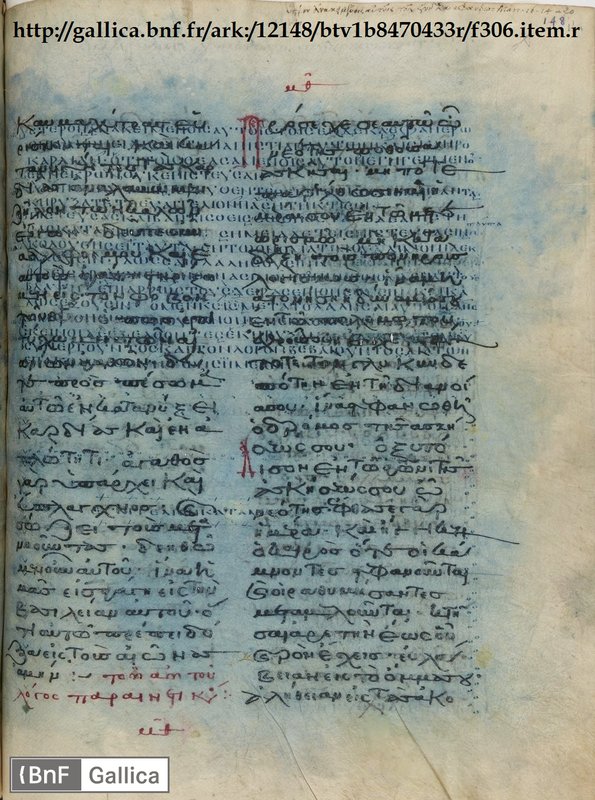 ● Codex Nitriensis (R, 027): In the 700s, a monk named Simeon needed parchment to make a copy of the Syriac composition Against the Impious John the Grammarian, by Severus of Antioch. To obtain the parchment, a few old Greek manuscripts were recycled: a manuscript of Homer’s Iliad from the 400s, a manuscript of Euclid’s Elements from the 600s, and a manuscript of the Gospel of Luke from the 600s. 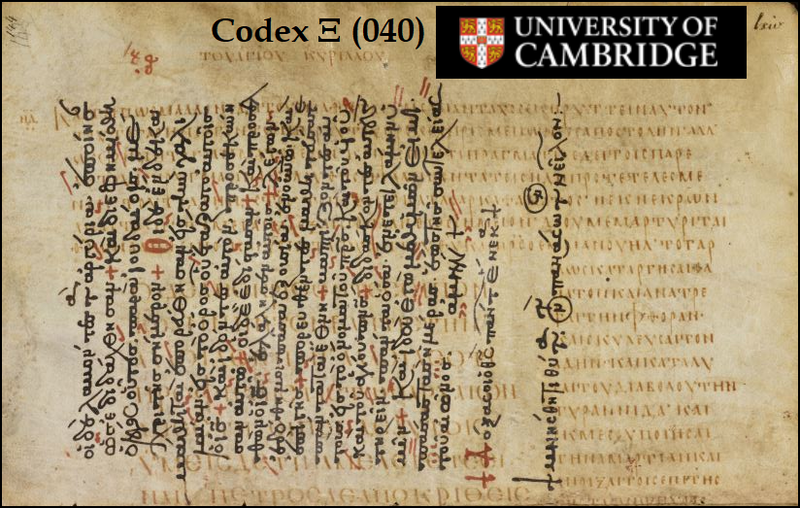 This manuscript was once in the impressive library of the monastery of St. Mary Deipara, which was located in the Nitrian Desert in Egypt; this is why it is called Codex Nitriensis. Luke 16 in Codex R (027). After this manuscript was purchased, William Cureton (the same researcher who discovered and published the Curetonian Syriac manuscript) published its text of part of the Iliad in 1851. Its text of Luke was studied by both Samuel Tregelles and Constantine Tischendorf; the latter published it in 1857 in his series Monumenta Sacra Inedita, volume 2 (beginning on page 56 of the downloadable file), and each page’s contents are identified in his transcription. Now housed at the British Library (and catalogued as Add. MS 17211), Codex R has been rebound so that the opening pages contain the portion which has text from the Gospel of Luke in the lower writing. Tischendorf managed to not only transcribe the text but also the Eusebian Section-numbers and the marginal note seen here (which accompanies text from Luke 16 but relates to the parable of the Prodigal Son which was on the preceding page). On some pages, quite a bit of the Greek text, written in two columns per page, is in the margins and is not obscured by the Syriac upper writing; on other pages practically all of the Greek text is thoroughly eclipsed. Some of the British Library’s digital images of pages of Luke have been helpfully indexed. 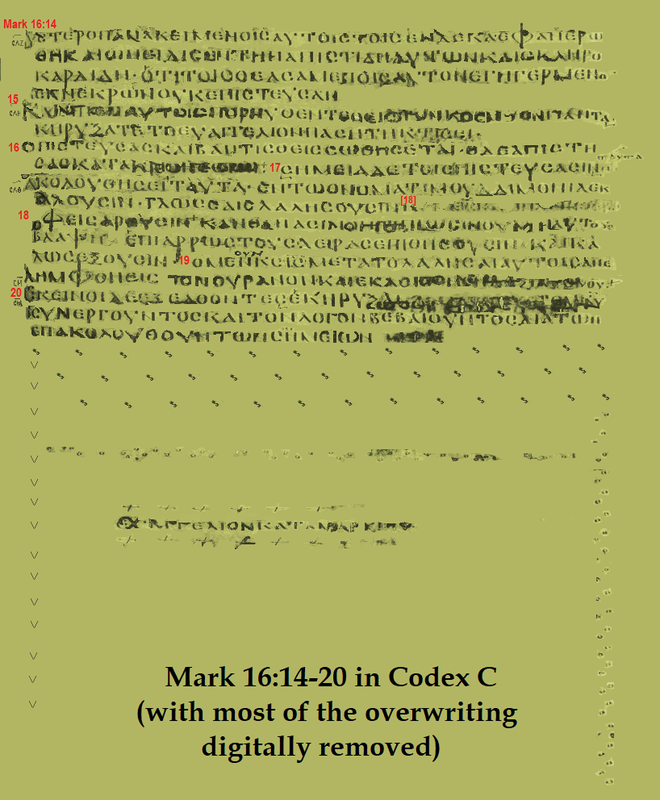 A study of the text of R by Robert Waltz indicated that there is considerable mixture in R’s essentially Byzantine text, especially in chapters 13, 14, and 15. It is one of the relatively few manuscripts which do not include Luke 22:43-44. Despite the importance of Codex R, the compilers of the 27th edition of the Nestle-Aland Novum Testamentum Graece deliberately stopped citing it, as stated in the Introduction of that edition. ● Codex Guelpherbytanus A (024, Pe) and 026 Codex Guelferbytanus B (026, Q) are two early Greek witnesses to the Byzantine text of the Gospels. They are often consulted together, because each one was recycled when someone in the 700s used their pages for writing-material with which to make a copy of the Latin text of Isidore of Seville’s Etymologies, a.k.a. Origins, a highly significant work in its own right. The person who prepared this palimpsest also recycled pages from a Latin-Gothic copy of Romans (this text is known as Codex Carolinus, a.k.a. Beuron 79) and the lower writing dates to the 500s or 600s), a Vulgate copy of the book of Judges, a Vulgate copy of Job, a copy of Ambrosiaster’s Commentary on Romans, and a copy of the Roman author Galen’s composition On the Properties of Foods. Tischendorf gave 024 and 026 his attention and transcribed then both: 024’s text of portions of Matthew, Mark, Luke, and John is recorded in Monumenta Sacra Inedita, Volume 6, published in 1869, following the title-page on digital page 276. Tischendorf’s transcript of 026’s text of portions of Luke and John (especially Luke) follows digital page 310 in Monumenta Sacra Inedita, Volume 3, published in 1860. Unfortunately, few individuals other than readers of Tischendorf’s publications (in which most of the introductions and notes were written in Latin) seem to have paid much attention to Codices 024 and 026. Bruce Metzger did not mention them in the chapter Important Witnesses to the Text of the New Testament in his textbook The Text of the New Testament. 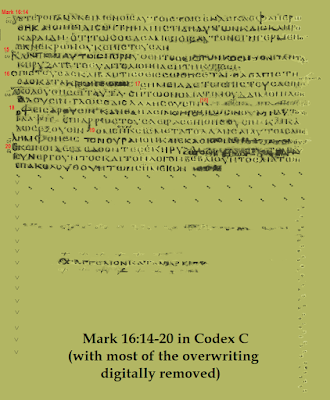 026, but not 024, was consulted for the Tyndale House edition of the Greek New Testament. Hopefully this neglect will not last long. A complete index of 024 and 026 (facilitating comparisons between the online digital images of the manuscript, and Tischendorf’s page-by-page transcript) is available as a free download among the files stored at the NT Textual Criticism group on Facebook. stands in the upper and lower margins. The text of Luke is written in different lettering. The old parchment was reused to make a medieval lectionary, written in black and ink. ● Codex Zacynthius (040, Ξ) is two New Testament manuscripts in one: the upper writing is Lectionary 299, produced in the 1200s or 1300s. The lower writing contains, in uncial script, text from the first half of the Gospel of Luke, and was probably written in the 700s, although some researchers have proposed that it was made in the 600s or even the 500s. The text of Luke is framed by a catena-commentary in the margins; the excerpts from patristic writings are also written in uncials, but the letters are smaller and vertically elongated so as to avoid confusion between the Scripture-text and the patristic excerpts. Included among the patristic writers cited in the catena – Chrysostom, Origen, Isidore of Pelusium, Titus of Bostra, Cyril of Alexandria (especially) and more – is Severus of Antioch, who wrote in the 500s (the same person whose composition constitutes the upper writing in Codex Nitriensis); this may seem to weigh in against the idea that the catena in Ξ was made during or very shortly after his lifetime; on the other hand, Severus’ name was erased, which suggests that the manuscript was read and used by someone who was apparently not altogether willing to attribute helpful comments to Severus on account of his problematic Christological views. One of the notable features of Codex 040 was noticed by Samuel Tregelles in his 1861 publication of its contents: chapter-divisions, accompanied by the letter Ψ, are the same as those found in Codex Vaticanus. This suggested to Tregelles what a detailed study of its text confirmed: it often agrees with the Alexandran uncials. At Luke 4:8, for example, Ξ is allied with Vaticanus and Sinaiticus by not including the phrase “Get behind Me, Satan” (Υπαγε οπισω μου σατανα). Tregelles avoided using chemicals to restore the text, preferring instead to use “every clear day for about four months” – by which I deduce that he held the pages up to sunlight (or else used a mirror to catch the sunlight and project it onto the pages) to see the lower writing. 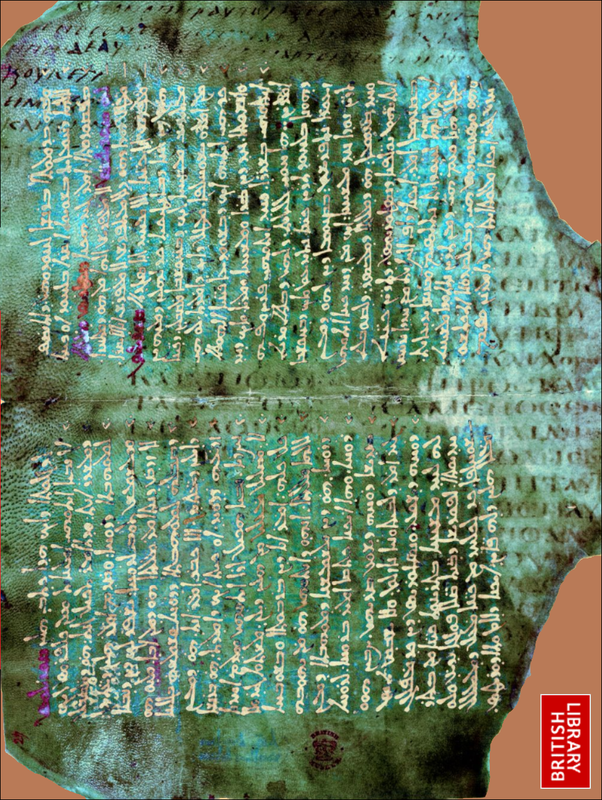 Modern-day researchers are using new methods, including multi-spectral imaging, to continue to investigate the text of this palimpsest. We may differ on TC, but I continue to be indebted to you and this blog for articles of this type, amazing research!